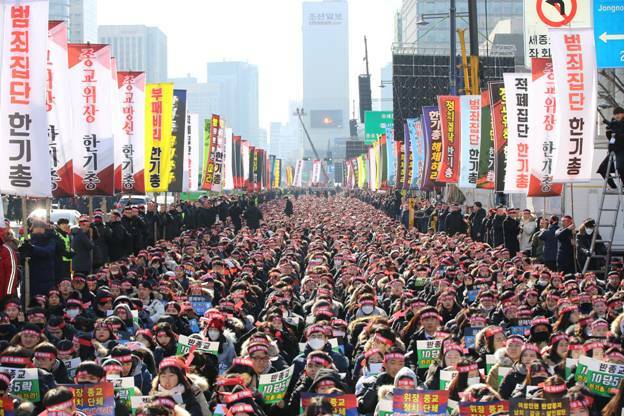 On Jan. 27, over 30,000 people from civil society organizations and religious groups came together at Gwanghwamun Square in a rally coordinated by the Global Citizens’ Human Rights Coalition, which is calling for the Christian Council of Korea (CCK) to be held accountable for their “unconstitutional actions and ultimately shut down,” according to Cheonji News. The CCK has been accused of corruption, anti-national, anti-societal and anti-religious actions, as well as coercive conversion programs which violate religious freedom. The CCK was especially charged with being concerned only with protecting its position of dominance, producing all kinds of false news in response to the growth of churches not registered in the CCK and accusing them of being cults, which brings about division and confusion within religious circles. Be the first to comment on "Global Citizens’ Human Rights Coalition Rally in South Korea for Religious Freedom"